River Rock Foursquare Church is an active part of the Foursquare Movement. Foursquare was founded in 1927 in Los Angeles, California with the first Foursquare Church, Angeles Temple. That church is still a large, thriving ministry in the heart of Los Angeles. Outside the building there is a large marker that was erected when the building was completed in 1923, which reads: “Dedicated to the Cause of International and Interdenominational Evangelism.” This central theme of our movement is also central to River Rock Foursquare Church. We believe that God is going to do incredible things in our region. This includes Molalla, Canby, Woodburn, Colton, Estacada and many small communities in this region known as the “Molalla River Basin.” Some may call these things a revival or an awakening. We believe that this significant and unique movement will begin within our region and move out to affect the Pacific Northwest and our whole nation. The Christian churches in our region must come together in a spirit of cooperation and like-minded resolve, to put down our petty differences and agendas for the sake of God’s will and plan. Every church is an expression of God’s grace and love. Every church has been planted in our region for the purpose of reaching groups of people for whom Christ died. We love, appreciate, and support other churches through prayer and fellowship. Our desire is NOT for there to be one church, but for there to be many churches that simply cooperate with each other, fellowship together, and work together to reach our communities and region. Toward this goal, we have vision to unite the church together by spending time worshiping, praying, and serving Jesus and our communities together. 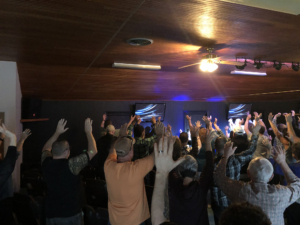 One way we desire to do this is through quarterly meetings called “United.” Those meetings will consist of worship, prayer, speaking the Word of God, and fellowship. Our hope is that many churches would participate in hosting these events. We have no agenda, no intent to harm, but to raise up a united church willing to work together. Another element of our vision is the creation of an online ministry board. We want this to be a central place where churches can post their outreach ministries, so people from different churches can volunteer to serve within those ministries. We want it to be a place where people can post ideas and suggestions regarding ways to reach people groups within our region and communities with the gospel of Jesus Christ through acts of service. The goal is to facilitate an arena of cooperation between churches and to better serve our communities. All of these things are ultimately for these purposes: to build the Kingdom of God and see many come into relationship with Jesus who “came to seek and save the lost” (Luke 19:10).